Here's a tip for anyone that has ever been swallowed up by a road map. The official state map from the Oklahoma Dept of Transportation is my favorite map to travel with. But on a bike, or even in a small car, it can get a little unwieldy. Most often you unfold it, find the area you need and then start performing map origami to fold it down to a manageable size. Wouldn't it be great to have something small, yet still see the area you're interested in? Here's a quick and easy option that won't cost you a dime! 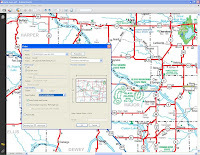 If you visit the ODOT website you'll find a link to download the official Oklahoma road map. It's a high resolution PDF file that will require your computer to have a program called Adobe Acrobat Reader. Once again, it's also free. Now open the map and move or zoom in until you have the perfect view- just the area of the map you're interested in. Next, select print from the file menu, but look for a special setting: Current View (click the image to see the actual settings). When you choose the Current View option you'll only print what you see on your screen. Using the fit to page and scaling options you can get it just right. Now in case you don't see that option in your version of Acrobat, don't sweat it. You just need to upgrade to a later version of Adobe Acrobat Reader. But it's easy to do, and free from the Adobe website. So now instead of playing map origami, you can make your own special map on whatever size paper your printer can handle. Plus, you get an enlarged view that's easy on the eyes!